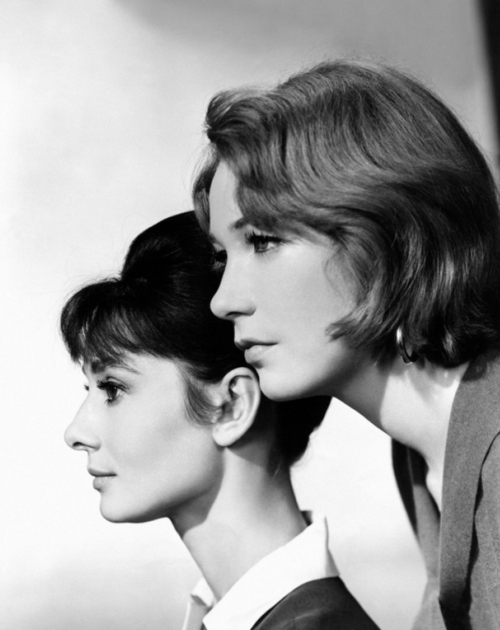 Audrey Hepburn and Shirley MacLaine in a publicity still to promote William Wyler's adaptation of Lillian Hellman's controversial 1934 stage tragedy about two teachers, Karen Wright and Martha Dobie, whose lives are torn apart when a resentful pupil at their New England boarding school begins spreading the untrue rumour that they are lesbians and carrying on an affair. Wyler had already shot the play earlier in his career as These Three (1936) with Merle Oberon and Miriam Hopkins at a time when the Motion Picture Production Code prohibited the text's taboo subject matter, forcing him to alter the central accusation and make it into a more palatable straight love triangle between Karen and Martha and the former's fiancé, Dr Joe Cardin (Joel McCrea). By the early sixties, screenwriter John Michael Hayes still wasn't allowed to use the "L" word or refer to the women's alleged homosexuality explicitly but remained otherwise largely faithful to Hellman's source. Wyler's second crack at The Children's Hour is very much a filmed play with everything spelled out, nothing left unsaid and a number of scenes drawn out for far too long in order to accommodate some weighty speechifying. It certainly has its faults but MacLaine is utterly compelling, as is Miriam Hopkins (returning after taking on the role of Martha in These Three) as the terminally vain and self-absorbed actress Aunt Lilly whose incautious jibes inspire young Mary Tilford's fatal fib in the first place. Fay Bainter is also pitch-perfect as the girl's strident and hysterical grandmother who leads the witch hunt before coming to realise all too late how horribly wrong she's been. The child actors are also strong, notably Karen Balkin as Mary and Veronica Cartwright as Rosalie Wells, the kleptomaniac blackmailed into endorsing her classmate's falsehood. Hepburn makes for a calm, gentle counterpoint to MacLaine's temperamental Martha and has the right sort of ethereal beauty one can imagine someone becoming infatuated with and imposing their romantic ideals and lonely fantasies upon but her performance ultimately comes across as a tad vague and passive, especially when juxtaposed with her fearless co-star, whom your heart just bleeds for. This remains a resonant and emotional bit of melodrama, whose best moment is arguably when the gaggle of leering male farmhands pull up at the gates of the empty school in a flatbed truck to leer at the women like vultures circling a wounded deer, their presence alone enough to convey great menace, hypocritical disapproval and a looming sexual threat, all without a word said. Revived last year in London's West End in a production starring Keira Knightley and Elisabeth Moss from Mad Men (2007-), Hellman's work deserves to live on for its sensitivity and very modern concerns - sexual identity, homophobia, the destructive power of gossip, slander and insinuation - which, if anything, are more topical today than they were when she first raised them in the mid-thirties.